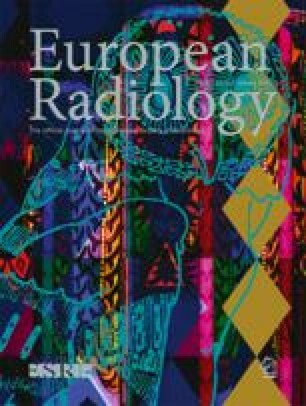 A prospective study correlating high-resolution computed tomography (HRCT), lung function tests (PFT) and bronchoalveolar lavage (BAL) cytology in patients with interstitial lung disease (ILD) associated with rheumatoid arthritis (RA). Fifty-three RA patients with suspected ILD (19 men, 34 women) underwent 71 HRCT (14 of 53 with sequential HRCT, mean follow-up 24.3 months). The HRCT evaluation by two observers on consensus included a semi-quantitative characterisation of lesion pattern and profusion on representative anatomical levels. Fifty-two HRCT were followed by PFT and BAL. Agreement or discordance of HRCT-, PFT- and BAL findings were analysed with Pearson’s correlation, κ score and McNemar’s test. Tobacco-fume exposure was estimated in pack years. Smoking/non-smoking groups were compared with Student’s t test. In 49 of 53 patients, HRCT was suggestive of ILD associated with RA (66 of 71 HRCT). Reticular lesions were found in 40 of 53 patients, in 15 of 40 presenting as mixed pattern with ground-glass opacities (GGO). Pure reticular patterns predominated in patients with long duration of ILD (p>0.01). Pure GGO were not observed. Lesion profusion was highly variable and correlated moderately negative with diffusion capacity (mean 88.2% (SD±20.9%); r=−0.54; p<0.001) and very weak with vital capacity and FEV1 (mean values 92.2% (SD±18.3%); r=−0.27; p<0.05 and 89.8% (SD±17.5%); r=−0.31; p<0.01). In patients with GGO, BAL differentials tended towards neutrophilia (κ=0.39; p=0.04; McNemar test p>0.2), but not towards lymphocytosis (κ=0.10; p=0.23; McNemar test p>0.2). Differences in smoking history were not significant (p>0.1). The HRCT appears most appropriate for the detection and follow-up of ILD associated with RA. The PFT and BAL correlate only partially with lesion profusion or grading on HRCT, but they contribute valuable information about dynamic lung function and differential diagnoses (pneumonia, medication side effects).